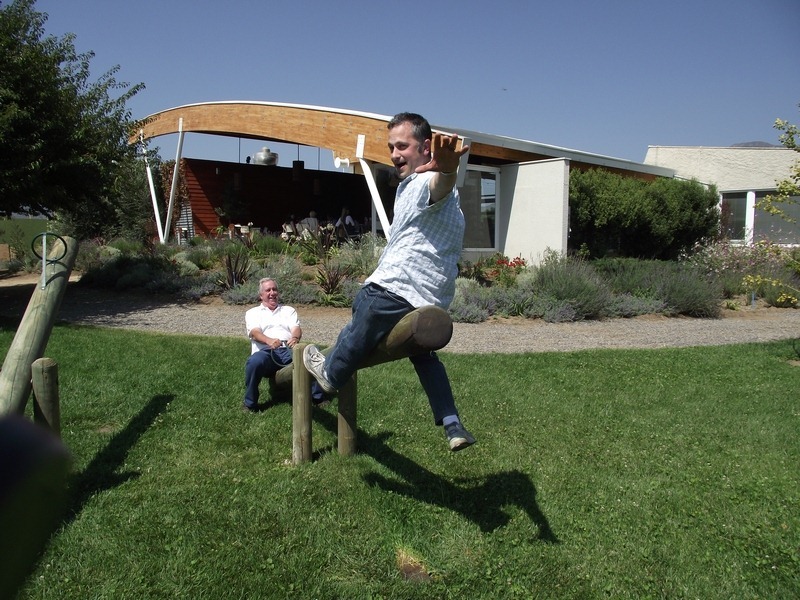 You don’t really know a winemaker until you’ve shared a seesaw ride with him. 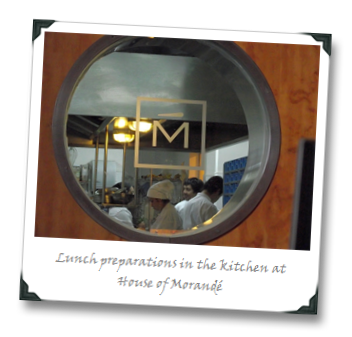 That’s my new mantra after visiting Viña Morandé’s “House of Morandé” restaurant and tasting bar (oh, yeah – and playground) just outside of Santiago in Chile. The playground is for the kiddies, to keep them occupied while mom and dad taste some wine. 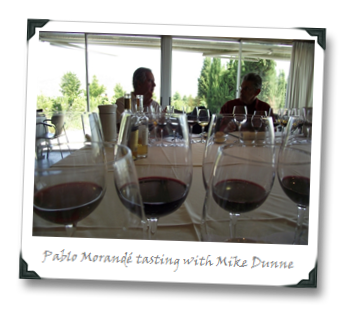 At least, that’s the company line from Pablo Morandé, winemaking director at Viña Morandé. Pablo comes off as a series, polite man; he’s tall, with white-grey hair, and a matter-of-fact look about him. 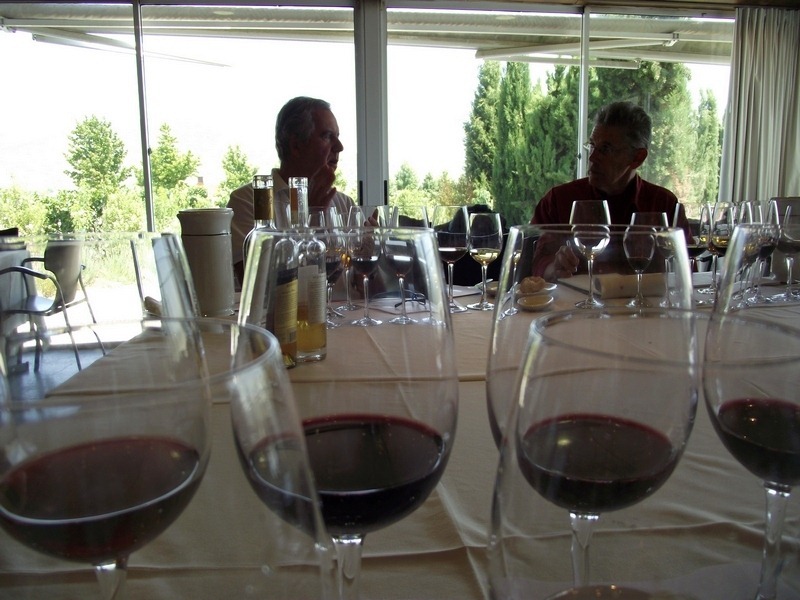 When asked questions, his answers are short, to-the-point, and delivered with a sort of “of course this is the answer” confidence that comes from being one of the pioneers of modern winemaking in the area. In other words, they’re hopelessly non-quotable; but who needs quotes when you’re sharing a seesaw moment, right? 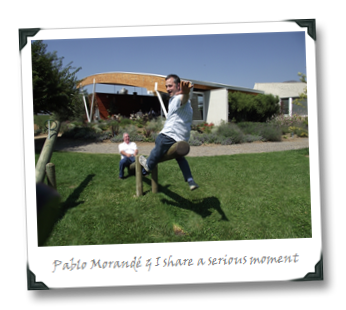 Anyway, I consider it a Vatican-worthy minor-miracle that we got Pablo Morandé on the seesaw. 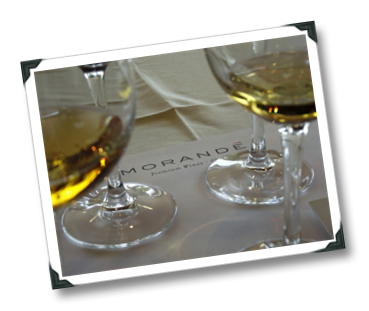 But then, after finishing up a tasting and lunch at his restaurant during which he wasn’t spitting, it probably shouldn’t come as too much of a surprise after all, despite his serious demeanor (I’m guessing that the wines helped). What that means is minimal SO2, natural malolactic fermentation, and long, cool macerations and low-temperature fermentations. Keep the fruitness! seems to be the unspoken mantra here. 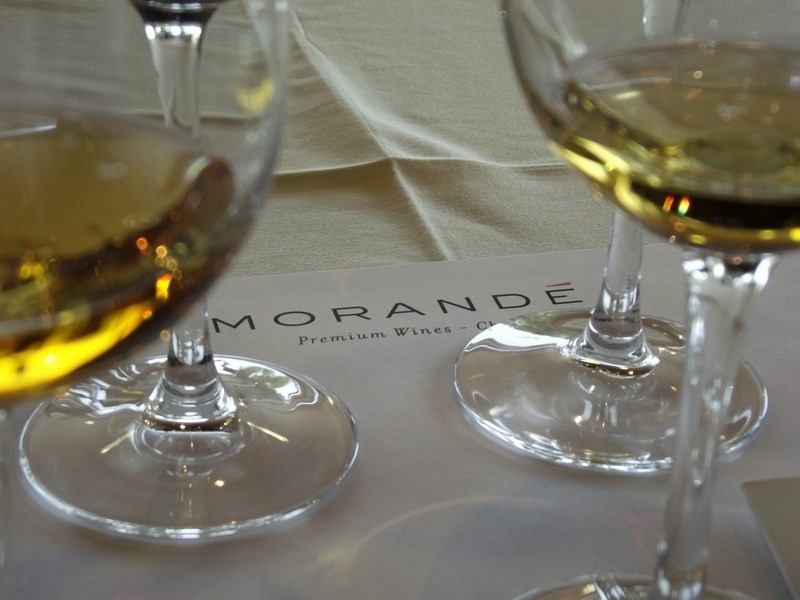 It also means focusing the most energy on the grape varieties with the most promise; while everyone and their sister in Chile is making Carmenère and Chardonnay, Morandé are focusing more on Sauvignon Blanc, Cabernet Sauvignon and things like Syrah and Carignan. Yes. Carignan. In fact, the Carignan almost didn’t get made (more on that in a minute). 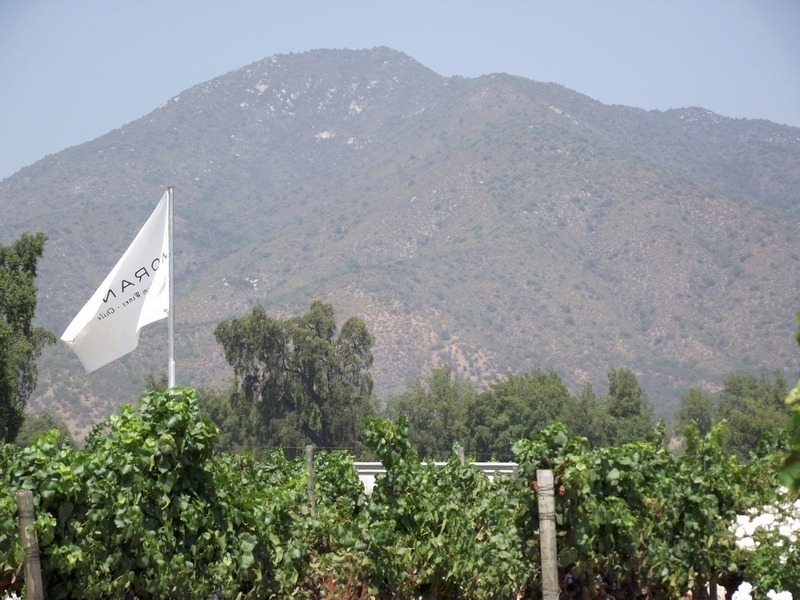 Pablo has strong views, even when it comes to what many worldwide consider to be Chile’s flagship grape variety, Carmenère. If you ask Pablo, Carmenère finishes way too short (“to give it a long finish, you need at least fifteen percent Cabernet Sauvignon” according to him), and isn’t made with consistently high enough quality to hang Chile’s reputation hat on yet. 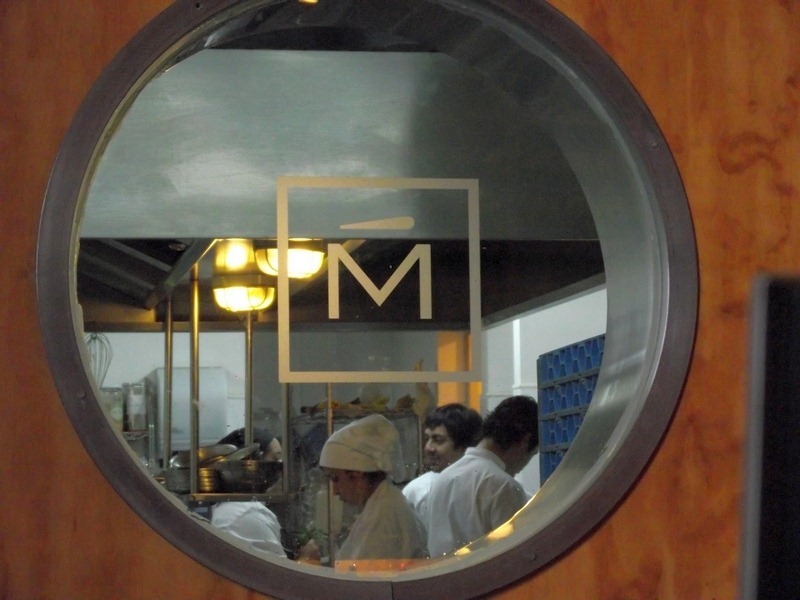 So where should Chile be focusing its vinous efforts? 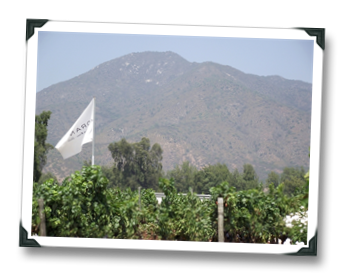 “I think the best variety in Chile is Cabernet Sauvignon” Pablo told me – with typical matter-of-fact, of-course-this-is-the-answer, don’t-dream-of-getting-a-quote-outta-me terseness. Of course. I’m not sure you’re going to find a more varietally-correct, vibrant, red-berry Pinot than this for under $15. 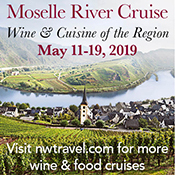 It also comes with rose petal and little bit of ‘grit.’ If you have a deck and own a grill, you need to cook up some salmon burgers and drink copious quantities of this wine with them at some point during the Summer. Speaking of varietally-correct, how about a Merlot that has green olives and herbs but also dark fruit and vanilla? This one delivers it all in a nice, mouth-filling, sub-$20 package, but what really makes this Merlot interesting is that it actually has a detectable finish – a relatively long one, actually, that has more than just booze on it (I don’t know about you, but it’s been a long time since I’ve had an inexpensive Merlot that either had any finish, or if it did have a finish it was so nasty I didn’t want it to have a finish…). Holy crap, a real honest-to-goodness botrytized wine that isn’t $65 for a half-bottle? Sign me up. This is only the second vintage of Golden Harvest since 2000, and it’s a screaming bargain for such a luscious, well-executed dessert wine. The classic “noble rot” treatment is done here (botrytized, raisined clusters; free-run juice & barrel-aging on the raisins; blah-blah-blah) only you get it at fraction of the price of the Old World stuff, and it’s actually better than a few Sauternes I’ve had lately. Yeast, lemon rind, clementines, mandarin oranges, sultanas… almost syrupy sweet but not quite tooth-achingly cloying. For the price, it’s a great way to experiment as to whether-or-not botrytized wines are for you (my guess is the answer will be “yes”).